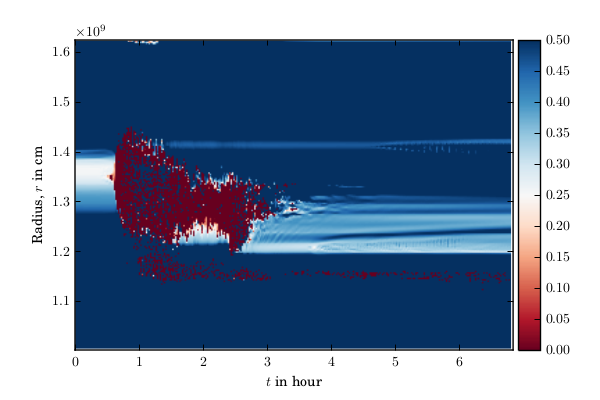 A code for multidimensional simulations of hydrodynamics in stellar evolution. The rotation of stars is a major source of uncertainty in stellar evolution. The enormous timescale of a star's life can only be covered by 1D models, which need to resort to approximations when treating the inherently multi-dimensional effects of rotation. In particular, hydrodynamical instabilities such as the dynamical shear are treated as diffusive processes. We strive to create self-consistent hydrodynamic models of shear instabilities in rotating stars. 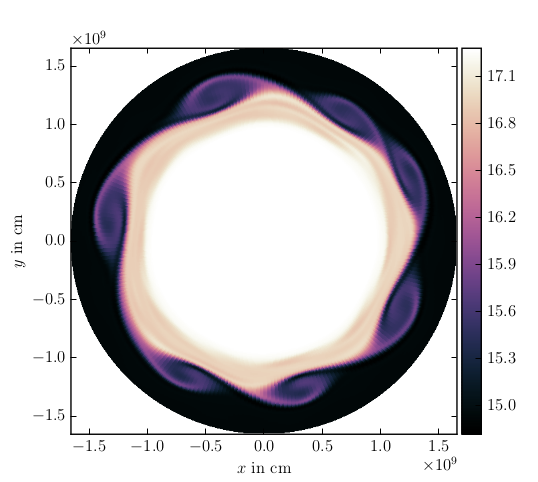 This study compares the effects of dynamical shear in a 2D SLH-simulation with the 1D model of a rotating, 20 M⊙ ZAMS star computed by Raphael Hirschi with the Geneva stellar evolution code (GENEC). Both codes use time steps of similar length in the particular phase simulated, which makes this constellation an excellent test bed for trying different prescriptions of shear instablites. The color-coded rotational velocity shows the profile along the stellar radius, changing over time. This shows the Richardson number along the stellar radius, developing over time. Red indicates regions of instability, blue stable regions, and regions at the limit are colored white. This view of the simulated two-dimensional plane shows a snapshot as shear instability develops. The color coding depicts the mean atomic weight as a tracer of fluid motion. 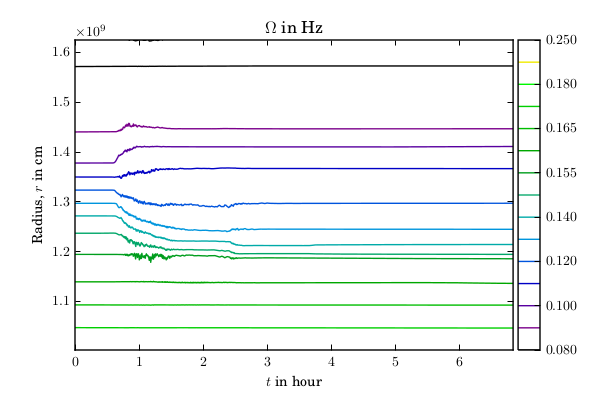 The video shows the development of shear instability at the equatorial plane, simulated over one hour of physical time. The panels show neutrino losses, nuclear generation, net energy gain/loss, the Richardson number, the square of the Brunt–Väisälä frequency, the mass fractions of carbon, neon and oxygen, angular velocity, and the deviation from the horizontal average of temperature and density.